Update Oct 28: the contest has ended but you can still make lots of spooky chocolates at Voilà Chocolat through Halloween. You can pack a lot of creativity into 6 ounces of chocolate, a 7" plaque mold, and cocoa butter colors with which to paint. This new $25 kids' activity includes all the chocolate, materials, tools, instruction, templates, and packaging to create and take your edible art home. Until October 28, 2015, enter our KIDS' HALLOWEEN CHOCOLATE PLAQUE CONTEST just by posting your Halloween-themed chocolate creation on Instagram or Facebook. If we choose your photo after October 28, you win a kids' chocolate-making activity for 4 at Voilà Chocolat! You can just drop-in, or reserve a time. 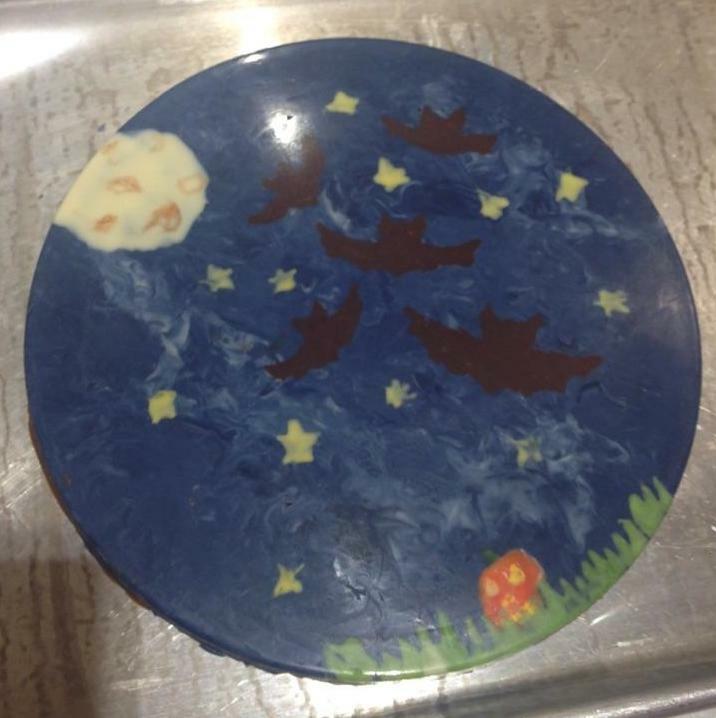 Make a chocolate plaque in any Halloween-theme you can dream up. The chocolate plaque-making activity is $25, and includes everything you need to get crazy and creative! Use this template at home, pick one up at the store, borrow one of our pre-made templates, or draw freehand. Take a photo of your chocolate plaque! Lots of Favorites or Likes on your photo will earn you *slightly* favored consideration in the contest. Slightly. The professional chocolatiering witches and goblins of Voilà Chocolat will choose a winner(s) after October 28, 2015. Judging criteria might include: scariness, creativity, chocolatiering skill, level of cuteness, number of likes on your photo, or other categories we make up. Adults get to just make things up all the time. Winner(s) will be awarded kids' chocolatiering experiences for 4 (retail value $100), which include making chocolate plaques and making 5 Voilàllipops. Enjoying a hot chocolate is totally optional, but makes your chocolate-making activity even more fun. Chocolates for the first 500 costumed trick-or-treaters who visit our store on Oct 31. Boo! Christopher Columbus' More Important "Discovery"